The incidence of heart disease in pregnant women is reported to vary from 1% to 4%, with rheumatic mitral valve disease being the most common etiology and accounting for nearly 60% of the cases. Cardiac disease in pregnancy, if untreated, is responsible for 10-15% of maternal mortality. In low-income countries, 60-80% of the pregnant women with heart disease suffer from rheumatic heart disease  and it is a major cause of death related to pregnancy. Indications for surgery using CPB during pregnancy include cardiac valve disease, prosthetic valve malfunction, cardiac myxoma, congenital heart disease, pulmonary embolism, aneurysm and coronary artery disease. CPB was first used in a pregnant patient in 1959, when a woman, with a 6 weeks gestation, underwent a pulmonary valvotomy and closure of an atrial septal defect. The mother survived, but the fetus spontaneously aborted 3 months later. Maternal mortality associated with CPB during pregnancy was earlier reported to be 3-15%. Recent data however suggests a maternal mortality rate similar (1.47%) to that associated with CPB in non-pregnant women, unless the surgery is emergent. Fetal mortality has however not reduced and remains at 16-33% in recent studies. , Cardiac surgery in pregnant patients, as a result, must be limited to cases where medical management fails. Various strategies recommended to improve feto-maternal outcomes are summarized in [Table 1]. The fetal blood circulation differs from the adult circulation. The arterial blood is not fully saturated because of arteriovenous admixture. The fetal hemoglobin is only 65% saturated and the oxy-fetal hemoglobin dissociation curve is shifted to the left to improve oxygen uptake at the placental level. Although the leftward shift of the curve improves uptake, the dissociation of oxygen to deliver oxygen is relatively restricted. A reduction in oxygen carriage, due to any factor, thus predisposes to early development of fetal distress. Maintenance of fetal cardiac output, fetal arterial pH and maternal hematocrit are important to maintain adequate oxygen uptake in the placenta and subsequent delivery to tissues. Fetal cardiac output is rate dependent, so fetal bradycardia results in fetal distress. The response of the feto-placental unit to CPB has been studied by experiments into fetal CPB and that has helped improve the management of perfusion in pregnant women. Placental function is dependent not only on the maternal side of the circulation, but also on the fetal side with its responses to interventions. Sustained forceful uterine contractions during cardiac surgery and CPB are considered as the most important contributors to fetal death. Sustained uterine contractions reduce uterine blood flow and intervillous perfusion and the resultant feto-placental insufficiency can cause fetal hypoxia. Thirty to 60 min after the fetus is removed from bypass a severe, progressive respiratory acidosis develops due to a rise in placental vascular resistance by activation of eicosanoid products. , This late acidosis is potentiated by low cardiac output secondary to an increase in fetal systemic vascular resistance (SVR). The rise in fetal SVR results from an increase in catecholamine levels due to fetal stress response secondary to fetal manipulation during surgery, anesthesia and fetal hypoperfusion. , The increase in fetal SVR is poorly tolerated by the immature fetal myocardium. An intractable metabolic acidosis, consequent to low fetal cardiac output, develops 6-8 h after CPB is discontinued and this acidosis can be associated with fetal death. Normothermic perfusion however may be associated with myocardial protection difficulties related to early rewarming of the left ventricle. In one report, a total of 3,500 ml of cardioplegia was required for satisfactory myocardial protection. Myocardial rewarming may be avoided with the use of continuous cold pericardial irrigation or continuous warm blood cardioplegia, which is effective even with long cross-clamp times. The latter may be the method of choice to prevent the crystalloid load imposed by frequently repeated boluses of cold crystalloid cardioplegia. Cardioplegia may however increase serum potassium levels, especially in cases with prolonged periods of cardioplegic arrest. Maternal hyperkalemia causes increased potassium diffusion into the fetal circulation through the placental chorionic villi. Fetal hyperkalemia leads to conduction disturbances and may even cause fetal cardiac arrest. Discarding coronary sinus return during cardioplegia delivery obviates the problem. Serum potassium concentration needs to be closely monitored with the goal to maintain it <5 mmol/L. Alterations in fetal heart rate may be observed even when maternal circulation, acid-base balance and perfusion pressure are stable. It has been postulated that these alterations are related to the narcotic effect of drugs used during anesthesia. Potential reasons for fetal asphyxia during maintenance of CPB include reduced maternal SVR, low uterine blood flow, hemodilution, hypothermia, prolonged CPB or maternal narcotic administration. Fetal heart rate monitoring allows analysis of fetal condition during CPB. Fetal heart rate monitoring is essential for early detection and management of alterations in fetal heart function. Fetal heart rate monitoring can be intermittently done for fetuses at <24 weeks gestation but should be continuously done for fetuses at ≥ 24 weeks gestation. Continual monitoring of the fetus postoperatively, for at least 12-24 h, is also recommended because there is a risk of preterm labor in this period. Fetal monitoring is commonly done using a cardiotachometer. Intraoperative fetal echocardiography shows the fetal cardiac reactions more accurately and its use is recommended. Doppler transducers are available to monitor fetal heart rate from the maternal abdominal wall, but these probes are difficult to maintain in place during surgery. Trans-vaginal probes can be used to monitor fetal heart rate and umbilical cord flow, especially if gestational age is low, however they are difficult to use and technically challenging. Fetal heart rate monitoring during CPB should be focused to maintain fetal heart rates between 110 and 160 beats/min  and to guide the perfusionist to adjust the perfusion flow rate, the mean arterial pressure and the maternal temperature. Bioprosthetic valves are implanted in women of childbearing age, who need to complete their families because anticoagulants can be avoided. Early reports suggested that pregnancy favors calcification of porcine xenografts, leading to bioprosthetic failure, , however, recent evidence shows that pregnancy does not increase structural deterioration or reduce the survival of bioprosthetic valves. Rarely, such patients with bioprosthetic valves may come for surgical replacement of failed xenograft during pregnancy. Women with mechanical prosthetic heart valves are advised against pregnancy as anticoagulant use is associated with severe teratogenic effects. Pregnancy increases the risk of thrombosis of prosthetic mechanical heart valves. , Pregnant women with such valves may present as surgical emergencies due to valve dysfunction resulting from valve thrombosis, endocarditis, perivalvular leaks or prosthesis structure defects. Such patients may be on oral anticoagulants or heparin and are prone to increased blood loss. Antifibrinolytic agents, such as tranexamic acid, are generally not recommended as pregnancy is an intrinsically hypercoagulable state  and their use must be reserved for extreme situations. Fetal mortality was described to be higher than 50% in patients in functional class III and IV in earlier studies. A recent study has found much lower mortality rates in functional class III (20%), but rates in patients in functional class IV (66.7%) continue to remain high. Careful optimization by medical therapy and improvement in the functional status of patient helps reduce mortality and morbidity. Other measures to reduce maternal and fetal mortality include avoiding functional deterioration during pregnancy and perhaps prescribing early surgery to prevent these patients from requiring an emergency procedure; performing surgery as fast as possible, with minimal CPB time; providing adequate fetal monitoring (cardiotachometer and intraoperative fetal echocardiography); and preferably performing surgery in the second trimester of pregnancy. Use of intraoperative trans-esophageal echocardiography helps optimize cardiac function and maintain adequate cardiac output apart from acting as a guide to assess surgical repair. Fetal losses appear to be associated with urgent, high-risk cardiac surgery, maternal comorbidities and operations performed at early gestational age. Fetal mortality declines if cardiac surgery was delayed and the fetus is allowed to mature. Attempts to delay surgery until an advanced gestational age minimizes the risks associated with prematurity and fetal demise. Determining the optimal timing of cardiac surgical intervention is one of the most challenging and critical clinical decisions in the care of the pregnant patient with cardiac disease and needs to be patient specific. Early intervention will decrease maternal risk, but may result in fetal demise. The ideal gestational age for operation is established as the period between the 13 th and 28 th weeks. , There is a higher trend towards fetal malformations in the first trimester; and to preterm delivery, maternal hemodynamic alterations and mortality in the third trimester. 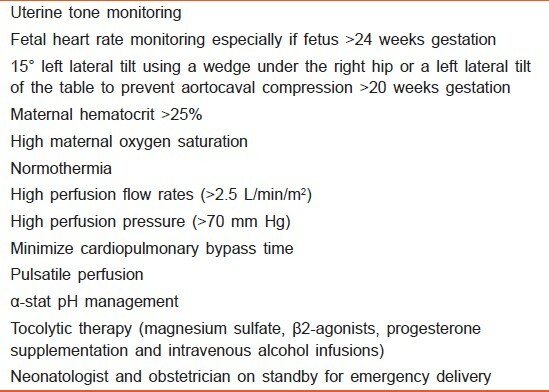 For conducting cardiac surgery using CPB, the second trimester is considered the safest gestational age as the maternal physiologic hematologic/hemodynamic changes have not peaked, uterine excitability least, aorto-caval compression not seen and fetal organogenesis is in an advanced safer stage. Delaying cardiac surgery until after delivery may result in maternal death. If the fetus is of advanced enough gestational age and the planned maternal surgery is anticipated to be complicated, prolonged in length or anticoagulation will be needed, delivery prior to CPB should be considered. Emergency Cesarean section is advocated for women who need to have a cardiac operation in the third trimester because the estimated fetal risks are high during CPB. To conclude, CPB management of pregnant women should be focused toward improving outcomes in both mother as well as the fetus. Acceptable maternal and fetal outcomes may be achieved by early pre-operative optimization of maternal cardiovascular status, use of perioperative fetal monitoring, optimization of CPB, delivery of a viable fetus before the operation and scheduling surgery on an elective basis during the second trimester. 1. Arnoni RT, Arnoni AS, Bonini RC, de Almeida AF, Neto CA, Dinkhuysen JJ, et al. Risk factors associated with cardiac surgery during pregnancy. Ann Thorac Surg 2003;76:1605-8. 2. Davies GA, Herbert WN. Congenital heart disease in pregnancy. J Obstet Gynaecol Can 2007;29:409-14. 3. Bhatla N, Lal S, Behera G, Kriplani A, Mittal S, Agarwal N, et al. Cardiac disease in pregnancy. Int J Gynaecol Obstet 2003;82:153-9. 4. Task Force on the Management of Cardiovascular Diseases During Pregnancy of the European Society of Cardiology. Expert consensus document on management of cardiovascular diseases during pregnancy. Eur Heart J 2003;24:761-81. 5. Dubourg G, Broustet P, Bricaud H, Fontan F, Trarieux M, Fontanille P. Complete correction of a triad of Fallot, in extracorporeal circulation, in a pregnant woman. Arch Mal Coeur Vaiss 1959;52:1389-91. 6. Chambers CE, Clark SL. Cardiac surgery during pregnancy. Clin Obstet Gynecol 1994;37:316-23. 7. Martin SR, Foley MR. Intensive care in obstetrics: An evidence-based review. Am J Obstet Gynecol 2006;195:673-89. 8. John AS, Gurley F, Schaff HV, Warnes CA, Phillips SD, Arendt KW, et al. Cardiopulmonary bypass during pregnancy. Ann Thorac Surg 2011;91:1191-6. 9. Parry AJ, Westaby S. Cardiopulmonary bypass during pregnancy. Ann Thorac Surg 1996;61:1865-9. 10. Lamb MP, Ross K, Johnstone AM, Manners JM. Fetal heart monitoring during open heart surgery. Two case reports. Br J Obstet Gynaecol 1981;88:669-74. 11. Hawkins JA, Paape KL, Adkins TP, Shaddy RE, Gay WA Jr. Extracorporeal circulation in the fetal lamb. Effects of hypothermia and perfusion rate. J Cardiovasc Surg (Torino) 1991;32:295-300. 12. Bradley SM, Hanley FL, Jennings RW, Duncan BW, Jester JA, Verrier ED. Regional blood flows during cardiopulmonary bypass in fetal lambs: the effect of nitroprusside. Circulation 1990;82 Suppl 3:413. 13. Fenton KN, Heinemann MK, Hickey PR, Klautz RJ, Liddicoat JR, Hanley FL. Inhibition of the fetal stress response improves cardiac output and gas exchange after fetal cardiac bypass. J Thorac Cardiovasc Surg 1994;107:1416-22. 14. Sabik JF, Assad RS, Hanley FL. Halothane as an anesthetic for fetal surgery. J Pediatr Surg 1993;28:542-6. 15. Mahli A, Izdes S, Coskun D. Cardiac operations during pregnancy: Review of factors influencing fetal outcome. Ann Thorac Surg 2000;69:1622-6. 16. Pomini F, Mercogliano D, Cavalletti C, Caruso A, Pomini P. Cardiopulmonary bypass in pregnancy. Ann Thorac Surg 1996;61:259-68. 17. Lin TY, Chiu KM, Shieh JS, Chu SH. Emergency redo mitral valve replacement in a pregnant woman at third trimester: Case report and literature review. Circ J 2008;72:1715-7. 18. Assad RS, Lee FY, Bergner K, Hanley FL. Extracorporeal circulation in the isolated in situ lamb placenta: Hemodynamic characteristics. J Appl Physiol (1985) 1992;72:2176-80. 19. Adzick NS, Harrison MR, Slate RK, Glick PL, Villa RL. Surface cooling and rewarming the fetus: a technique for experimental fetal cardiac surgery. Surg Forum 1984;35:313-6. 20. Champsaur G, Parisot P, Martinot S, Ninet J, Robin J, Ovize M, et al. Pulsatility improves hemodynamics during fetal bypass. Experimental comparative study of pulsatile versus steady flow. Circulation 1994;90:II47-50. 21. Khandelwal M, Rasanen J, Ludormirski A, Addonizio P, Reece EA. Evaluation of fetal and uterine hemodynamics during maternal cardiopulmonary bypass. Obstet Gynecol 1996;88:667-71. 22. Willcox TW, Stone P, Milsom FP, Connell H. Cardiopulmonary bypass in pregnancy: Possible new role for the intra-aortic balloon pump. J Extra Corpor Technol 2005;37:189-91. 23. Vedrinne C, Tronc F, Martinot S, Robin J, Allevard AM, Vincent M, et al. Better preservation of endothelial function and decreased activation of the fetal renin-angiotensin pathway with the use of pulsatile flow during experimental fetal bypass. J Thorac Cardiovasc Surg 2000;120:770-7. 24. Reddy VM, McElhinney DB, Rajasinghe HA, Liddicoat JR, Hendricks-Munoz K, Fineman JR, et al. Role of the endothelium in placental dysfunction after fetal cardiac bypass. J Thorac Cardiovasc Surg 1999;117:343-51. 25. Wilkes BM, Krim E, Mento PF. Evidence for a functional renin-angiotensin system in full-term fetoplacental unit. Am J Physiol 1985;249:E366-73. 26. Bradley SM, Hanley FL, Duncan BW, Jennings RW, Jester JA, Harrison MR, et al. Fetal cardiac bypass alters regional blood flows, arterial blood gases, and hemodynamics in sheep. Am J Physiol 1992;263:H919-28. 27. Hess Ow, Davis CD. Electronic evaluation of the fetal and maternal heart rate during hypothermia in a pregnant woman. Am J Obstet Gynecol 1964;89:801-7. 28. Pardi G, Ferrari MM, Iorio F, Acocella F, Boero V, Berlanda N, et al. The effect of maternal hypothermic cardiopulmonary bypass on fetal lamb temperature, hemodynamics, oxygenation, and acid-base balance. J Thorac Cardiovasc Surg 2004;127:1728-34. 29. Sakaguchi M, Kitahara H, Seto T, Furusawa T, Fukui D, Yanagiya N, et al. Surgery for acute type A aortic dissection in pregnant patients with Marfan syndrome. Eur J Cardiothorac Surg 2005;28:280-3. 30. Buffolo E, Palma JH, Gomes WJ, Vega H, Born D, Moron AF, et al. Successful use of deep hypothermic circulatory arrest in pregnancy. Ann Thorac Surg 1994;58:1532-4. 31. Korsten HH, Van Zundert AA, Mooij PN, De Jong PA, Bavinck JH. Emergency aortic valve replacement in the 24 th -week of pregnancy. Acta Anaesthesiol Belg 1989;40:201-5. 32. Lichtenstein SV, Abel JG, Panos A, Slutsky AS, Salerno TA. Warm heart surgery: Experience with long cross-clamp times. Ann Thorac Surg 1991;52:1009-13. 33. Lee W. Clinical management of gravid women with peripartum cardiomyopathy. Obstet Gynecol Clin North Am 1991;18:257-71. 34. Chandrasekhar S, Cook CR, Collard CD. Cardiac surgery in the parturient. Anesth Analg 2009;108:777-85. 35. Koh KS, Friesen RM, Livingstone RA, Peddle LJ. Fetal monitoring during maternal cardiac surgery with cardiopulmonary bypass. Can Med Assoc J 1975;112:1102-4. 36. Trimakas AP, Maxwell KD, Berkay S, Gardner TJ, Achuff SC. Fetal Monitoring during cardiopulmonary bypass for removal of a left atrial myxoma during pregnancy. Johns Hopkins Med J 1979;144:156-60. 37. Patel A, Asopa S, Tang AT, Ohri SK. Cardiac surgery during pregnancy. Tex Heart Inst J 2008;35:307-12. 38. Karahan N, Oztürk T, Yetkin U, Yilik L, Baloglu A, Gürbüz A. Managing severe heart failure in a pregnant patient undergoing cardiopulmonary bypass: Case report and review of the literature. J Cardiothorac Vasc Anesth 2004;18:339-43. 39. Becker RM. Intracardiac surgery in pregnant women. Ann Thorac Surg 1983;36:453-8. 40. Rossouw GJ, Knott-Craig CJ, Barnard PM, Macgregor LA, Van Zyl WP. Intracardiac operation in seven pregnant women. Ann Thorac Surg 1993;55:1172-4. 41. Bernal JM, Miralles PJ. Cardiac surgery with cardiopulmonary bypass during pregnancy. Obstet Gynecol Surv 1986;41:1-6. 42. Werch A, Lambert HM, Cooley D, Reed CC. Fetal monitoring and maternal open heart surgery. South Med J 1977;70:1024. 43. Dodd JM, Reid K. Tocolysis for assisting delivery at caesarean section. Cochrane Database Syst Rev 2006;4:CD004944. 44. Yaju Y, Nakayama T. Effectiveness and safety of ritodrine hydrochloride for the treatment of preterm labour: A systematic review. Pharmacoepidemiol Drug Saf 2006;15:813-22. 45. Bortolotti U, Milano A, Mazzucco A, Valfre C, Russo R, Valente M, et al. Pregnancy in patients with a porcine valve bioprosthesis. Am J Cardiol 1982;50:1051-4. 46. Sbarouni E, Oakley CM. Outcome of pregnancy in women with valve prostheses. Br Heart J 1994;71:196-201. 47. DeLaRosa J, Sharoni E, Guyton RA. Pregnancy and valvular heart disease. Heart Surg Forum 2002;6:E7-9. 48. Pavankumar P, Venugopal P, Kaul U, Iyer KS, Das B, Sampathkumar A, et al. Closed mitral valvotomy during pregnancy. A 20-year experience. Scand J Thorac Cardiovasc Surg 1988;22:11-5. 49. Weiss BM, von Segesser LK, Alon E, Seifert B, Turina MI. Outcome of cardiovascular surgery and pregnancy: A systematic review of the period 1984-1996. Am J Obstet Gynecol 1998;179:1643-53. 50. Nazarian M, McCullough GH, Fielder DL. Bacterial endocarditis in pregnancy: Successful surgical correction. J Thorac Cardiovasc Surg 1976;71:880-3. 51. Salazar E, Zajarias A, Gutierrez N, Iturbe I. The problem of cardiac valve prostheses, anticoagulants, and pregnancy. Circulation 1984;70:I169-77. 52. Qasqas SA, McPherson C, Frishman WH, Elkayam U. Cardiovascular pharmacotherapeutic considerations during pregnancy and lactation. Cardiol Rev 2004;12:240-61. 53. Kole SD, Jain SM, Walia A, Sharma M. Cardiopulmonary bypass in pregnancy. Ann Thorac Surg 1997;63:915-6. 54. Arnoni AS, Andrade J, Falcão HCB, Souza SCS. Cardiac Surgery in Pregnancy. Rev Bras Cir Cardiovasc 1986;1:14-9. 55. Crowther CA, Harding JE. Repeat doses of prenatal corticosteroids for women at risk of preterm birth for preventing neonatal respiratory disease. Cochrane Database Syst Rev 2007;3:CD003935.